How Do Our Dance Classes Work? Our class night is every Thursday at the Fed. 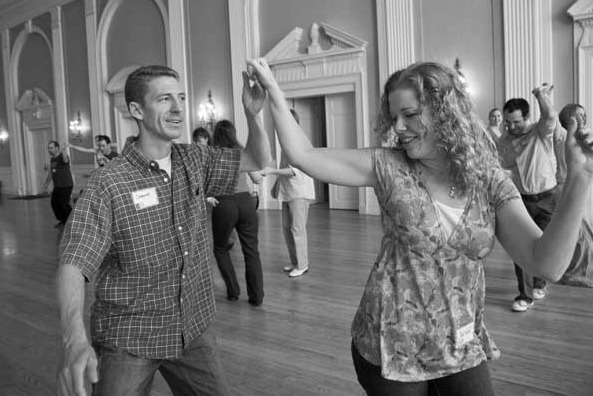 Every month, we start a new four-week series of classes, including Intro to Swing, Lindy Hop, Balboa and Collegiate Shag, and different levels to move up to. Each month is progressive - meaning every week reviews and builds on the material taught the week before. Complete each series / multiple series at each level, repeat them if it helps, get all you can out of each level, and let us help you along. We support each student in reaching the class goals before moving up. If you ever need help or feedback, we are happy to give you our time. You don't have to bring a partner! Every class rotates. All registration is at the door - no advanced registration or reservations required. PLEASE ARRIVE 15 minutes before class starts so you can register and be in class for when it starts. Especially before your first class. PARKING - See parking details to make your night easier. You can register for two classes back-to back as long as the level is appropriate for you. Many of our extra class offerings are for all levels or for beginners. Please Note - Admission to the Syndicate Dance at 9 pm is only $5 when you take classes that night. Your name badge from class gets you the discount. We will NO LONGER be using our class credits policy. Go to the Four On The Floor Page, "Like" us, and it will come to your FB Newsfeed.